Well guess what? While it is essentially a derivative of the previous CPU, there’s a whole lot more to the 8th-gen Core i7 than you think. It’s enough of a difference, in fact, that it’s probably one of the rare times we can say it may be worth upgrading over the previous CPU generation. So yeah, that means it’s a big deal. We’ll explain why—and show you benchmarks to prove it—below. Here are all the 8th-gen Core mobile CPUs in a nice, neat chart, courtesy of Intel. What exactly is 8th-gen Core? Count us in with the group of nerds who believe the 8th-gen rollout has been as tangled up as an abused Yo-Yo string. First, we had 8th-gen Core i7 “Coffee Lake S” for desktops. Then we had 8th gen Core i7 “Kaby Lake R” for ultraportable laptops. Why it’s called Kaby Lake R instead of Coffee Lake U we don’t know. Now, we finally get 8th-gen Core i7 “Coffee Lake H” chips for larger laptops and gaming laptops. And yes, you’d be kinda right if you said that 8th-gen Coffee Lake is largely an improved 6th-gen Skylake CPU, first introduced to laptops in late 2015. Along the way though, Intel has made many improvements. The 7th-gen Kaby Lake’s video processing engine, for example, was greatly improved, and it generally ran at higher clock speeds than 6th-gen Skylake could. With Coffee Lake, Intel takes the mature 14nm process and tenderizes the hell out of it, enough to deserve the 8th-gen “14++” moniker. The MSI GS65 Stealth Thin RE is designed to look at home in a corporate conference room. 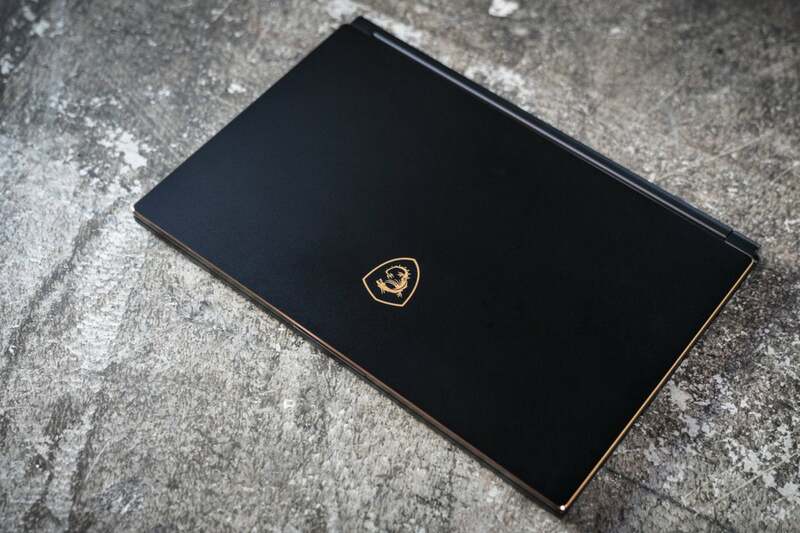 Only the Dragon logo might give away its gaming chops. Unlike removable desktop CPUs, where you can control just about all of your variables such as cooling, power, memory, and storage, laptops CPUs are generally to be treated as entire packages, because they’re soldered to the motherboard. Design decisions by the laptop maker also greatly impact performance. Certain vendors may tune for all-out performance, while others may ratchet things back to control the fan noise. All this, of course, is influenced by the cooling in the laptop, which is often influenced by the sheer size of the chassis. For this shootout, we decided to compare the 6-core MSI GS65 Stealth Thin with the thick-and-large 17-inch Lenovo Legion Y920 (review forthcoming). The Legion Y920 is rolling a quad-core Core i7-7820HK CPU. Because the CPU is unlocked and a showcase feature of it is overclocking, we also tested the Core i7-7820HK in the Legion Y920 with the overclock switch engaged. Representing the previous generation is the Asus ROG Zephyrus GX501. The ROG Zephyus GX501 is a 17-inch laptop, but ultra-thin and equipped with the popular 7th gen quad-core Core i7-7700HQ CPU. 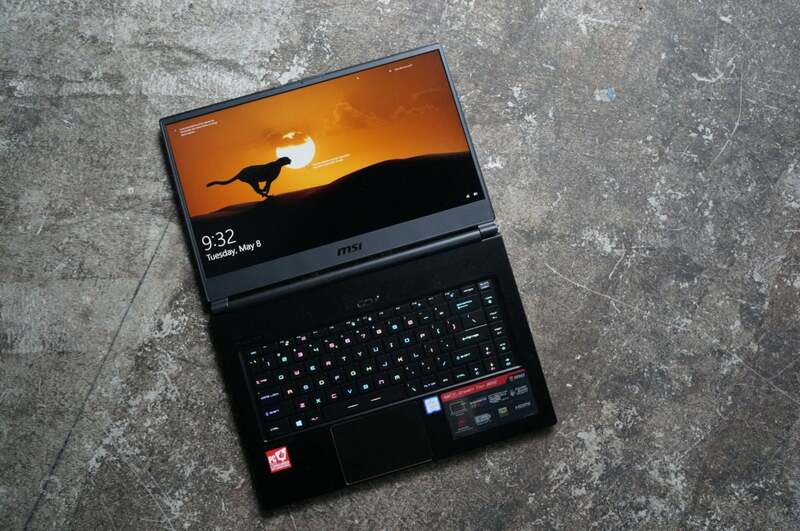 The 6-core 8th gen Core i7-8750H in the MSI GS65 Stealth Thin easily schools larger laptops with 7th-gen CPUs in them. Keep in mind that the three laptops used for this CPU roundup all feature different GPUs: The Lenovo Legion Y920 has a GeForce GTX 1070, the Asus ROG Zephyrus GX501 has a GeForce GTX 1080 Max-Q GPU, and the MSI GS65 Stealth Thin uses a GeForce GTX 1060. Due to the disparity of the GPUs and their outsize influence on graphics, we did not delve into graphics performance for this review. You should really make your graphics buying decision based on other factors, not the CPU. The first result is Cinebench R15. It’s a benchmark built around Maxon’s Cinema4D engine and favors more cores and more cores. 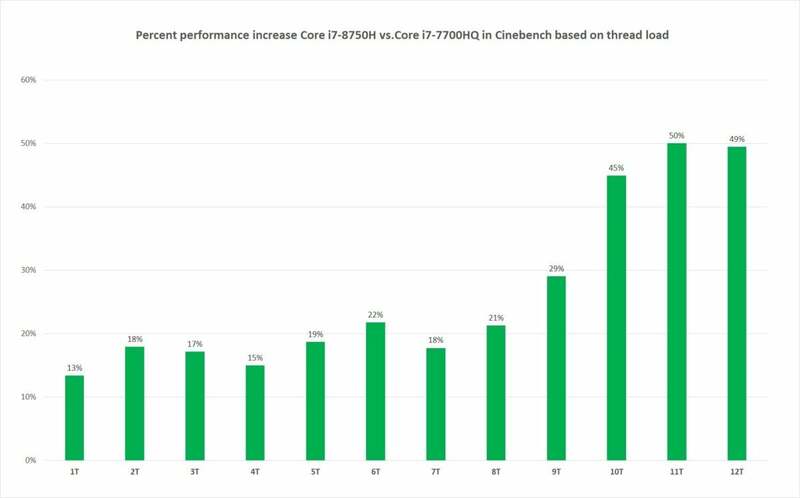 No surprise, the increase from 4 to 6 cores yields a pretty huge performance boost. 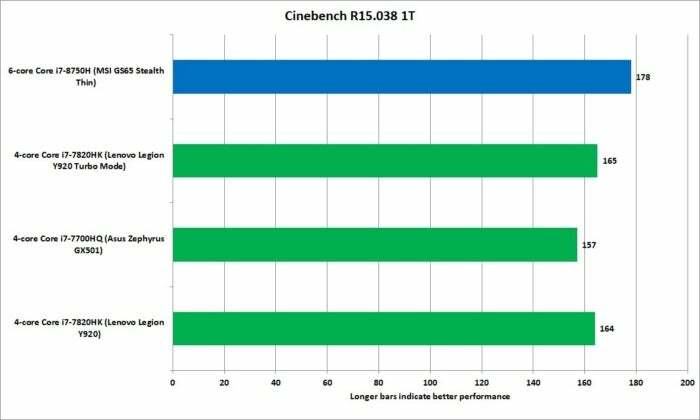 Although Cinebench R15 is mostly a predictor of multi-threaded performance, you should expect to see generally similar results in other applications that will actually use all 12 threads or 6 cores of the Core i7-8750H CPU. 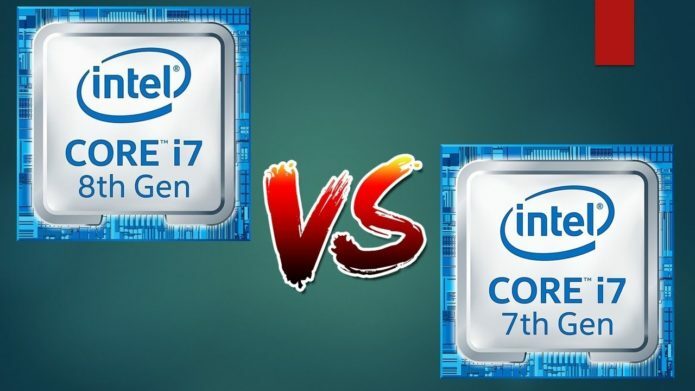 Even the overclocked Core i7-7820HK can’t stand against the latest 8th-gen Core i7-8750H, because of the simple math of 6 cores are better than 4. The thing is, not all applications are multi-threaded. In fact, we’d argue few are so efficient as to give you the same results you see above. It’s probably far more important for those not rendering 3D, editing video, or doing other intensive content-creation tasks to look at single-threaded performance of a laptop CPU. To gauge that we also ran Cinebench R15 using a single CPU thread. Predictably, things even up quite a bit, but the newer 8th-gen CPU is still leader of the pack. In fact, even against the overclocked Core i7-7820HK, it’s ahead by more than 7 percent. And against the far more “normal” Core i7-7700HQ in the Asus ROG Zephyrus GX501, you’re looking at a 13-percent increase in performance. Thanks to the higher clock speeds of the 8th-gen Core i7, it has a double-digit edge against most standard CPUs. 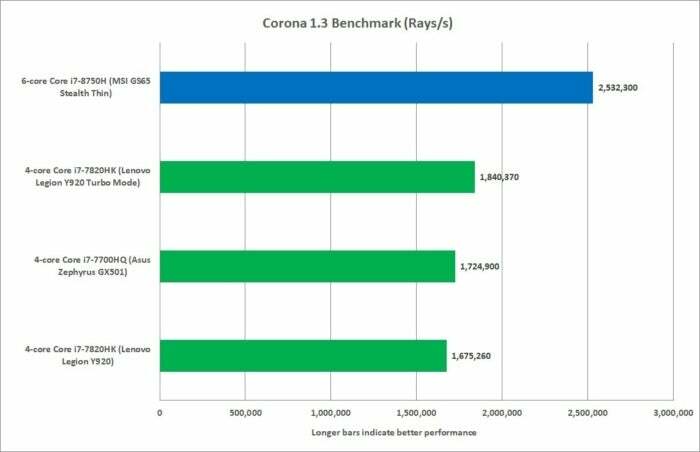 Our next test is the Corona 1.3 benchmark. It’s built on the Corona Photorealistic renderer for Autodesk’s 3ds Max. Like Cinebench and most rendering apps, it favors more cores. 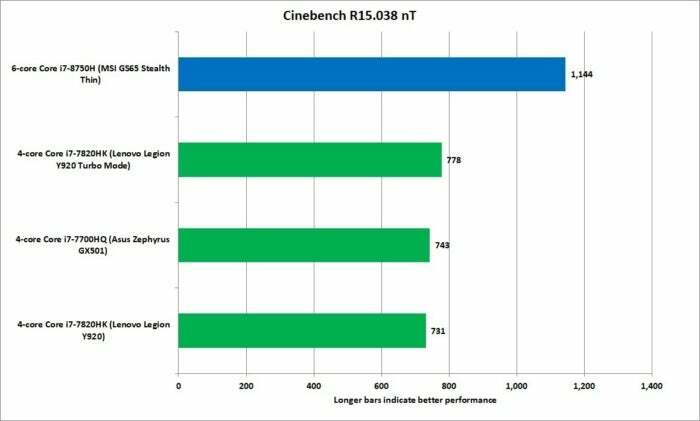 The results confirm what we saw in Cinebench, which is simple math: 6 cores are better than 4. The Corona Renderer is a photo-realistic renderer that confirms more cores matter when you’re doing rendering. Our last rendering benchmark uses the free Blender app to measure how long it takes to render a single frame using Mike Pan’s popular BMW benchmark file. The performance isn’t quite as dramatic as Corona’s, Cinebench’s, or other rendering benchmarks we’ve tried, but it’s still a very decent bump. So why does Blender put these CPUs much closer than Cinebench, Corona, or V-Ray? (we ran V-ray but didn’t bother with showing you a chart because it’s pretty much a clone of Corona and Cinebench’s results). We believe it’s because of the length of the actual tests. Cinebench and Corona run in a minute or two, while the BMW workload can take around 10 minutes. As you heat up a laptop CPU, the clock speed begins to drop slowly to manage the heat. On the Core i7-8750H, its performance advantage over quad-cores mostly derives from core count and clock speed. On longer loads, most of the clock speed advantage will burn off. 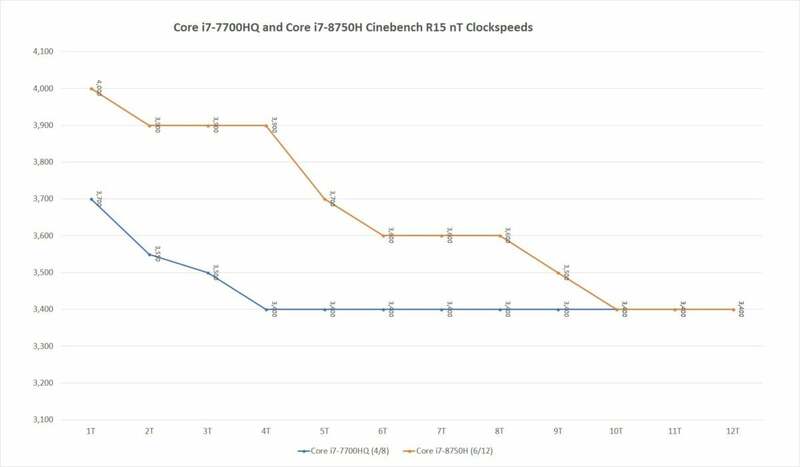 This is also likely why the Lenovo’s default speeds on the Core i7-7820HK are rather unimpressive, while its overclocked performance gets much closer to the Core i7-8750H’s. Still, chalk this up in the win column for the 8th-gen Core i7-8750H. 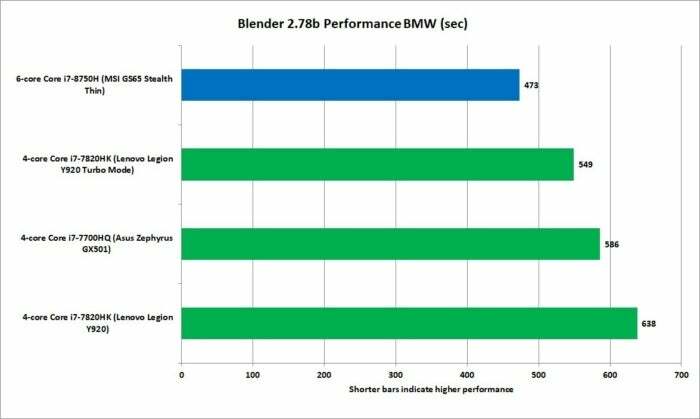 The BMW workload in Blender takes longer to run than most rendering benchmarks, which neutralizes the high clock speed advantage of the Core i7-8750H. For an encoding test, we take a 30GB 1080P MKV file and transcode it using HandBrake 9.9 and the Android Tablet preset. Like the Blender BMW test, it typically takes 45 minutes or so to finish on a quad-core laptop, largely nullifying any high clock speed advantage. This particular test shows just how valuable the extra cores are, because even with its high clock advantage gone, it finishes the encode in about 33 minutes vs the 46 minutes of the Core i7-7700HQ. More cores help the Core i7-8750H finish our encode in about 33 minutes compared to 46 minutes of a Core i7-7700HQ. That’s a significant performance advantage. 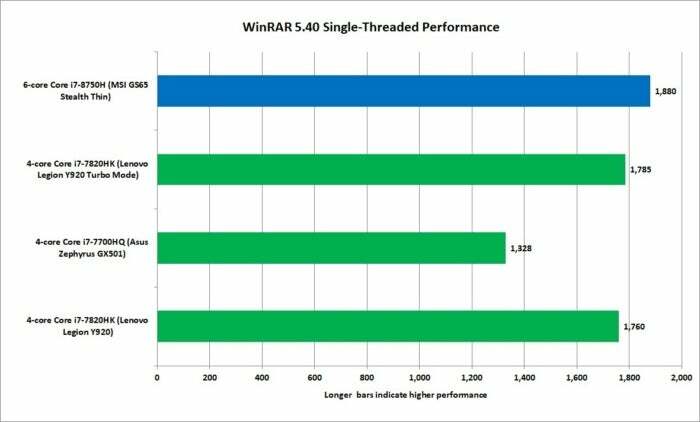 We’ll wrap this up by looking at the performance of the CPUs in WinRAR’s internal compression benchmark. The first result is the single-threaded performance of the laptops CPUs. The higher-clock speed of the Core i7-8750H again shines through, but like the single-threaded results of Cinebench up above, it’s actually pretty close. Oddly, the Core i7-7700HQ of the Asus ROG Zephyrus GX501 under-performed here. We reran the test multiple times and the results didn’t vary so it’s not a mistake. With the Core i7-7700HQ performing quite well everywhere else, we suspect this may be the odd memory configuration of the unit we tested: 24GB. Asus used a 16GB DIMM and an 8GB DIMM, which means the memory bandwidth isn’t always running in dual-channel mode. Because WinRAR does favor increased memory bandwidth, this memory configuration may have been enough to hurt it. In single-threaded performance everything was as expected except for the oddly low performance of the Core i7-7700HQ. 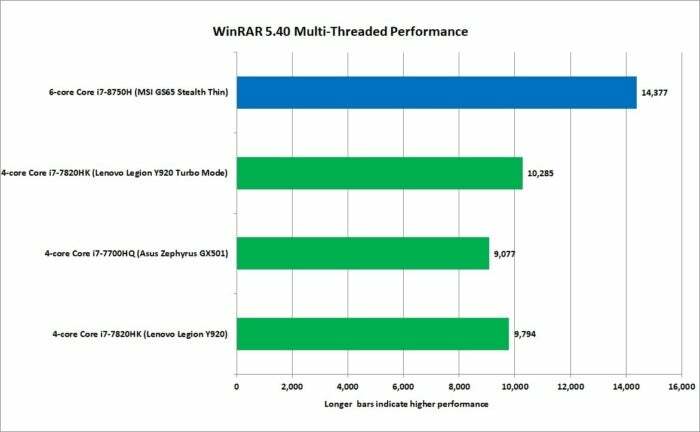 Running WinRAR in its multi-threaded mode, the results moved back to what we expected. Again, simple math prevails on multi-threaded tests and 6 > 4. Even the Core i7-7700HQ in the Asus was back to normal. More cores are better, WinRAR says, and the Core i7-8750H has more cores. So let’s break down the advantage of the Core i7-8750H in a little more detail. As you know, more cores is better, but Core i7-8750H also runs at far higher clocks most of the time. Not all apps will use the maximum amount of cores on a CPU, nor will they all use only a single thread. To dive into that, we reached for Cinebench R15 again and ran the test with it set to use from 1 to 12 threads on the Core i7-8750H (green bars below) and from 1 to 8 on the Core i7-7700HQ (blue bars below). We used the Core i7-7700HQ because this is the chip that will most closely compete with the Core i7-8750H. We use Cinebench R15 and limit the threads to try to suss out how well the CPUs perform on a given load. One problem with the chart above is it doesn’t scale with the actual performance gain. 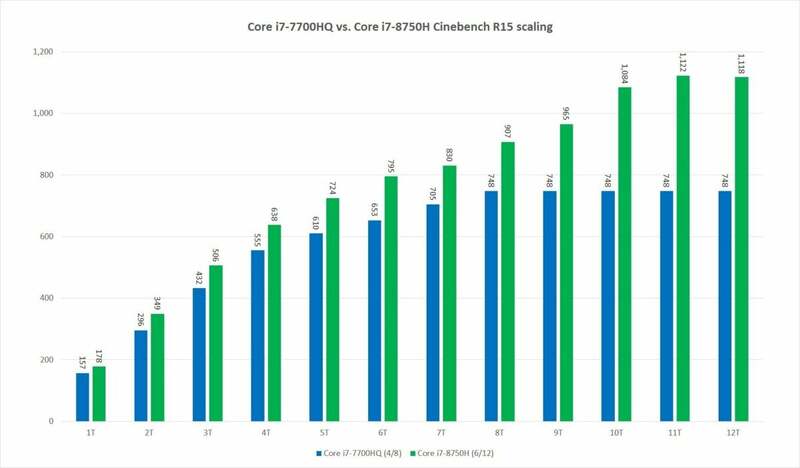 In the next chart, we’ve calculated the advantage the 8th-gen Core i7-8750H has over the 7th-gen Core i7-7700HQ. Obviously, most of the performance is on the right side of the chart, because having six cores is almost always going to be better (if they’re in the same family.) But there’s a very solid double-digit performance gain on the lighter loads, too. 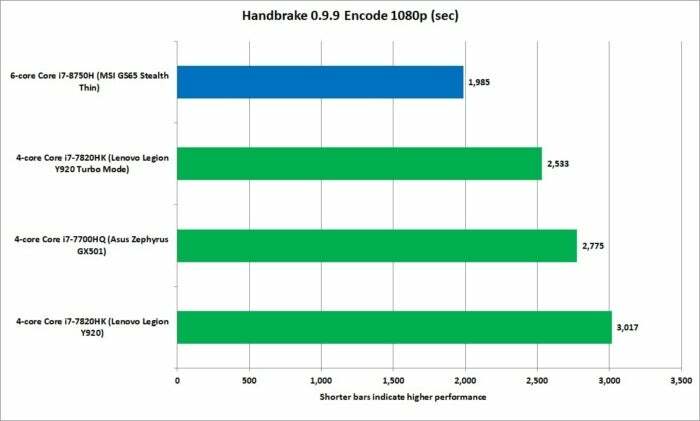 Most of the performance gain is on multi-threaded loads, but the Core i7-8750H also gives up solid double digits on lighter loads. Because the Coffee Lake H is essentially the same micro-architecture as Kaby Lake H, the gains are mostly Intel’s (and OEMs’) comfort levels with pushing the chips to higher clock speeds. To get a little more insight into just how much of an advantage that is, we re-ran Cinebench R15 using loads while increasing the amount of threads the program used. We recorded the rough clock speed 20 seconds into the benchmark. We say “rough” because it’s not exactly 100-percent repeatable, and is a stop-watch-based and Mark I eyeball recording of the results. Still, the data is plenty useful, as you can see the Core i7-8750H (yellow line below) is cooking along at far higher clock speeds on lighter loads than the Core i7-7700HQ is. You can also see that even though there is no clock speed advantage on the right side of the chart due to the increased thermal load, it doesn’t matter because the Core i7-8750H can call for backup from those two extra CPU cores. You can see the clock speed advantage the Core i7-8750H has over the Core i7-7700HQ on lightly threaded apps. Even though there’s no megahertz difference on the heavy loads it doesn’t matter because the 8th gen part has more cores to use. We’ve all rightly become pretty cynical about Intel’s laptop CPUs and the “generational” tag. Over the last few years, we can say that there have been few to no reasons to upgrade. For example, if you bought a 5th-generation Core i7, you really had absolutely no reason to upgrade to a 6th-gen Core i7. After all, all you’d really get is a 6- to 7-percent performance bump. So yeah, yawn. For the first time in forever, though, there’s an actual reason you might need, might actually want to upgrade from the previous generation. If you, for example, just bought a 7th-generation Core i7 to do video editing, rendering, or anything that truly needs more performance, we can happily say taking a loss on that old laptop for a new 8th-generation Core i7 is finally worth it. You’ll get reasonable performance bumps on lighter loads, and you’ll get huge performance gains on the heavy loads. Not everyone needs it. If you push Word and a browser all day—stick with what you have. But for everyone who bought a Core i7 laptop to get real work done, the 8th-gen Core i7 is a worthy upgrade that’s long overdue.